Hi folks, Doc here. Here's a look at a special set from the final years of traditional A.C. Gilbert Erector production. 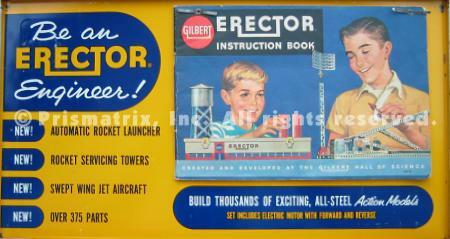 From 1960 to 1962, Erector was winding down its long run. At the same time however, Gilbert created two variations on selected sets from its regular product line specifically for sale at Sears and Montgomery Wards department stores. 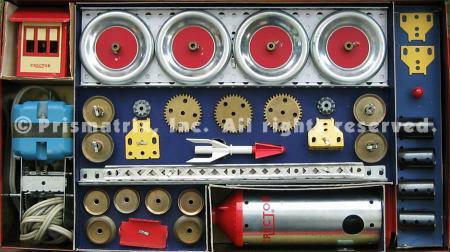 Three different sets were available in this alternate product line, each one essentially equivalent to a "regular" Erector set except for the packaging. The Sears sets were called the "Science-Career Series", the Ward sets were called the"American Science Series." Both series featured special artwork lithographed on the box lids, with that on the Sears sets being the most elaborate. The largest of the three Sears sets, the No. 10064 "Automatic Conveyor" set, is the subject of this pictorial. With the exception of the special box artwork (shown above), the No. 10064 was identical to the No. 10063 set in the regular Erector line. However, this artwork makes the No. 10064 especially collectible. 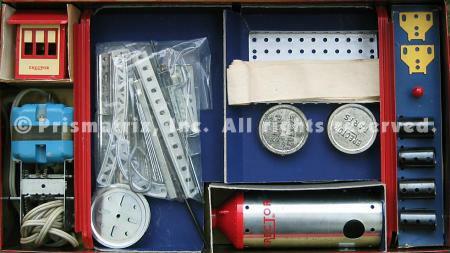 The inside of the box lid is shown in the image below; note that the the instruction manual is attached to the lid by two t-clips that pass through holes in both the manual and the lid. The second and third images below show the contents of the set, which are arranged in three carboard insert trays (two stacked in the center, one on the right side) and two cardboard compartments for the boiler and house. Two part cans sit in holes in the lower insert tray. Overall, the box measures 18" x 10" x 3". The set included an A49 electric motor and a P14A686 plastic rocket, a part shared with the American Flyer electric train system. 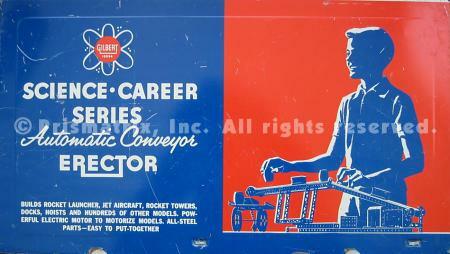 And, as the name suggests, the set also included the TA woven cloth conveyor belt. Upper parts insert, plus boiler, motor, etc.